Bowe’s Exxon Car Care Center is an authorized dealer for BOSS Snowplows, snow removal equipment, and parts for the greater Philadelphia, PA market. If you’re in the market for a commercial grade plow a municipal plow or a snow plow for your ATV, Bowe’s has you covered. Call and speak with our trained staff today. They’ll answer all your questions and match the correct Boss snow plow to your needs. SmartHitch®–changing forever the standard in snowplow attachment time, SmartHitch allows snowplow operators to attach and detach a plow in a matter of seconds in three very simple steps. SmartHitch represents the latest in breakthrough technology for snowplow mounting systems. 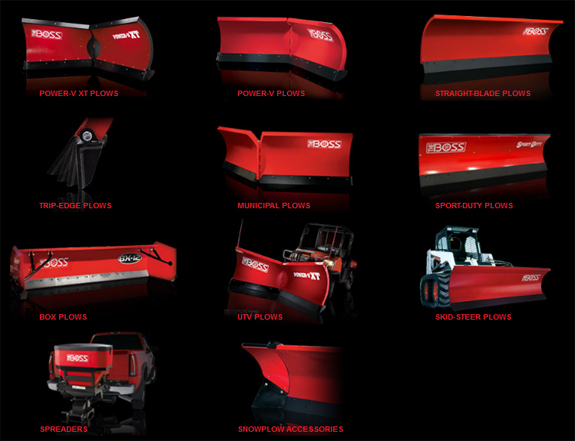 Power-V Multiposition Plow–synonymous with THE BOSS, the Power-V Plow, introduced and perfected by the company more than two decades ago, is the industry standard for multiposition snowplows. SmartLight™–It’s no secret that visibility is a major concern when plowing or transporting a snowplow. That’s why SmartLight2 illuminates wider, farther and more consistently than any other plow light on the market today. Our state-of-the-art reflector optics and Dual Bulb Illumination provide a more consistent light pattern not found in competitor light packages. And when you have a long night of plowing ahead of you, Halogen InfraRed (HIR) bulbs provide a whiter light that’s less fatiguing to the eyes. SmartShield®–Setting the standard in the industry for paint finishes, THE BOSS SmartShield baked-on powder-coat paint finish begins with an exclusive zinc primer. The zinc primer adheres to the metal better providing superior corrosion resistance and gives each plow a high gloss shine that keeps your plow looking great for years to come. Call us with all of your snow plow, snow removal and salt spreader needs 1-610-828-6522.